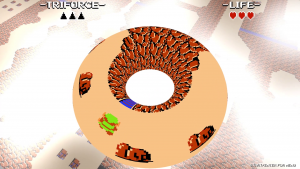 From its appearance, to its music, to its layout, the Overworld of 1986’s The Legend of Zelda is instantly recognizable to a generation of gamers. Many Zelda fans stake claim to the fact that they spent hours exploring every corner, every nook and cranny, of this 8-bit map. And some of us can still effortlessly navigate those familiar screens to this day. For those looking for a way to see the world of the original Legend of Zelda from a brand new perspective, the free puzzle game Triforce has recently been made available for all to experience. Developed by university professors Stephanie Boluk and Patrick LeMieux, Triforce seeks to examine the physical space of the NES classic “by visualizing the 8-bit game in three dimensions.” The result is both trippy and captivating, as the familiar areas of The Legend of Zelda — like the Lost Woods or certain dungeons — are presented not on a 2D plane, but on a collection of 3D objects like cones, donuts, and Möbius strips. 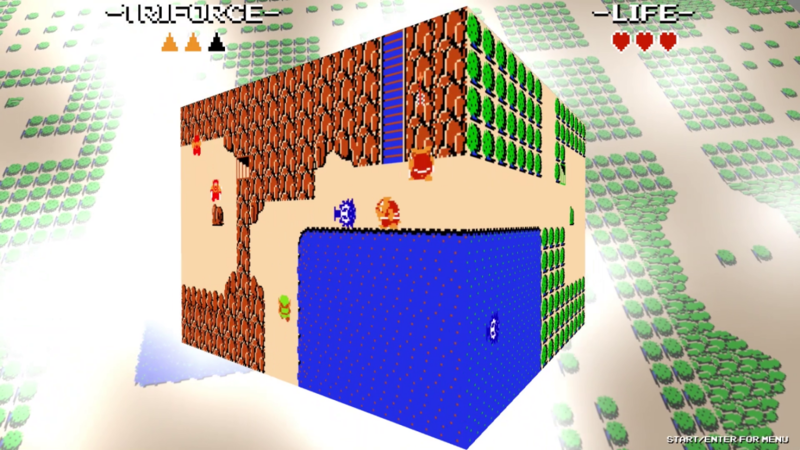 Triforce tasks players with navigating different parts of the Legend of Zelda map in order to collect three fragments of the Triforce. The game begins as we’d all expect it to: Link is dropped in the Overworld, he enters a cave to obtain a sword, and he is sent on his way to explore the rest of Hyrule. But things only get weirder from there. 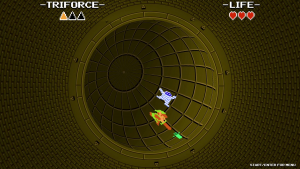 Navigation is the greatest challenge in Triforce, as players must both move Link through an area and rotate the 3D object on which that area is placed. Each new area brings its own set of rules to Zelda‘s reality; controls may become inverted or you may lose Link behind the curve of some 3-dimensional shape. 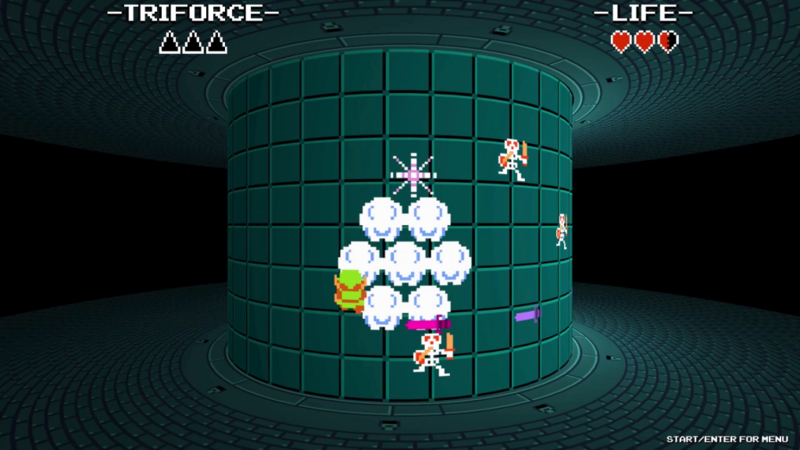 Even the Triforce rooms at the end of each dungeon will break your brain! Though recently made available as a standalone release, Triforce was originally published in 2017 as part of Boluk and LeMieux’s book Metagame, which explores the alternative, unexpected, and transformative ways in which people engage with videos games. Metagame is unique in itself for being one of the rare books to include original software for each chapter. Triforce serves as the companion of the book’s first chapter, which surveys various forms of “metagaming” within the vast gaming community. 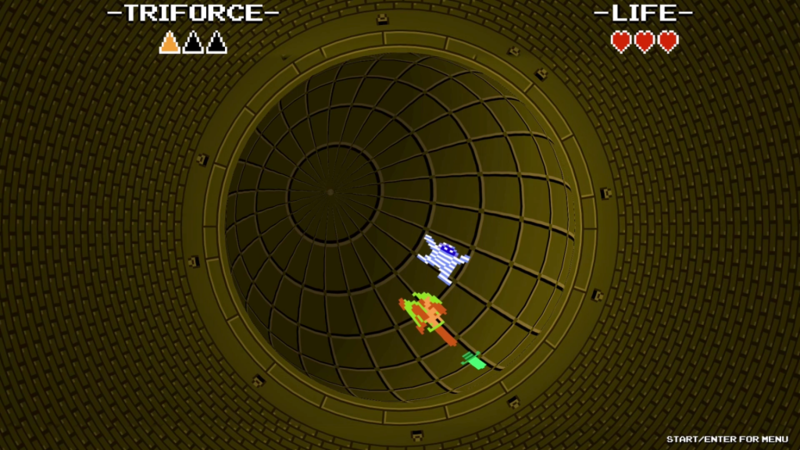 Triforce features graphics, music, and text from The Legend of Zelda. 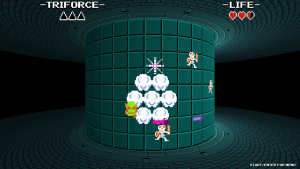 While we can normally expect Nintendo to take legal actions against fan games or projects that utilize its intellectual property, Triforce was designed for education purposes and therefore within fair use. You can download Triforce for free right here. You can also check out the book Metagame right here. What do you make of this mind-bending puzzle game? Will you give it a try for yourself? Share your thoughts in the comments below.